In this post we’ll be seeing our 2018 review of the 5.11 Tactical Rush 12 Backpack. For outdoor enthusiasts and those who love to go on adventures, you need to have a backpack where you can put all of your essential stuff and other items. And since conditions greatly vary, it helps that you get a bag that is designed for outdoors, a bag that has a roomy space, various storage options and has specific features that will allow you to put different stuff even when you are on the go. 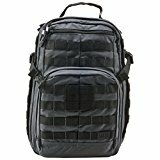 Among the most popular choices that you can find in the market today is the 5.11 Tactical Rush 12 Back Pack. This is not your ordinary bag as it is a multipurpose bag for different use. Whether you need a hunting backpack or an emergency bag, the versatility that it offers is just one of the things to like about this product. But keep in mind that at the end of the day, it still boils down to preference, what you need and where you intend to use the back. It Does Not Come With Computer Padding So You Will Have To Buy Your Own To Make Sure Your Computer Is Secured. 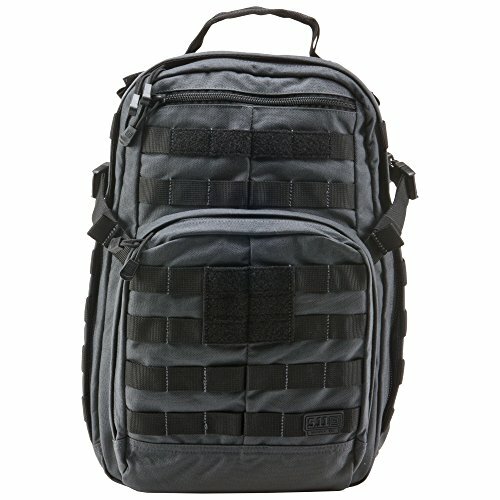 Is the 5.11 Tactical Rush 12 Backpack the best choice for you? What makes this bag pack a widely popular choice among many? Let’s go into further details. Water Resistant: The bag uses 1050D nylon material and it is water resistant which is a pretty much essential feature especially if you are going out on a hunt or if you are outdoors where weather conditions can sometimes be unpredictable. 2 Hook and Loop Location: Now, you can customize your bag using a nametape and also moral patches depending on your choice. Adjustable Sternum Strap: To reduce stress on your shoulders and to have more stability, the bag comes with an adjustable sternum strap. Even when you are on the go, the bag is secured. Extensive Wrap-Around: The 5.11 SlickStick and MOLLE system are compatible which allows you to customize even your storage based on your needs. Huge Storage Options: With its 16 compartments, it gives you different storage options as each compartment is sized for particular use. The back also has a fleece-lined pocket where you can put your sunglasses. How does the bag look like inside? Admin Panel: It features a 12x9x1.75 inch. compartment at the front that comes with an admin panel where you can put small items and other accessories. Spacious Main Compartment: One of the things that people like about this bag pack is that is has a roomy compartment 18x11x6.5 inch. main compartment and a bungee pocket where you can put your laptop or other items. Mesh Pockets: To have an organized bag, it has various mesh zipper pockets to make it easier for you to organize your things. The purpose having these mesh pockets is for you to easily see through them. Simply by looking at the bag pack, you can already see that is a heavy-duty bag that is created for the outdoors. Grab Handle: The bag comes with reinforced grab handle so you get to have strong grip. It also comes with ports located on both sides. You can use these ports if you want to use hydration hoses. Compression Straps: Even when you are running and on the move, the bag is secured with its 2 compression straps that will keep your gear tight. For its price, this is already a value for money back pack that you can take wherever you go and for a wide range of use. Whether you are going out on an adventure or in any other outdoor activity, the 5.11 Tactical Rush 12 Back Pack offers you stability and security. You can be sure that all of your personal belongings and other valuables are kept safe and secured inside your bag with its huge space and storage options. It may have its downsides but when you carefully look at it, these are just minor things that most people are willing to forego considering the features and the over-all design of this bag. After all, even if it is only available in black, the bag pack still has a very nice and rugged design that is perfect for use even for technical or range use or even if you are traveling. On top of that, having a backpack that is designed for people who are on the move, you never have to worry about mobility as this bag has amazing features.